I recently had a conversation with somebody about how important social media has been to my job search and I figured that this information would be useful to others. First, some background: I relocated to Ottawa from Vancouver in August and have been looking for my next opportunity since that time. I believe that social media is invaluable when it comes to researching potential job opportunities. One of the main reasons for this is that you can often get unfiltered/unedited information about a company, job openings and interviewers before you even step foot in an interview room. Given the popularity of social media these days, there is also a wealth of information available that is often free and easy to find. You just have to know where to look! Even though I am going to talk about searching on-line for information about jobs, I should point out that networking is always one of the best ways to find out possible job openings. If you have a large, active network behind you then I would suggest that is the single best place to start. Twitter is also becoming a popular place for job postings. Most cities have business directories that will have lists of companies you might want to work for. In Ottawa, there is the Ottawa Business Journal's annual Book of Lists. You should use that list to search and see if a company is on Twitter and if they are, you can follow them. I also recommend looking at Twitter accounts on Twitter.com to see who the company/contact is following and who is following them to expand the list of companies/people you are following. Twitter now has a nifty list feature so you can also see who is on a contact's lists and follow them. I also recommend trying to find people that are well connected in your city and following them. Connected people often post openings on Twitter that come from their network. Ideally you can get out to meet these people face to face, but meeting on Twitter isn't bad either! I also suggest searching to see if there is a an Twitter account like OttawaJobs or something similar in your city that posts openings. I rarely use Twitter.com to interact with Twitter. Instead I use an API called TweetDeck. One of the best features in TweetDeck is the ability to have searches permanently saved in columns that continually update. I recommend setting up searches for the types of positions you are interested in for your city as something might come up there as well. More on using TweetDeck below. Corporate blogging was all the rage a few years ago and they can be a wealth of information about companies and job openings. Most often, a company will blog about needing talent and if you subscribe to the RSS feed (if available) you don't even have to go to the blog... you just need to watch your RSS feeds. Side note: If you aren't using RSS feeds yet then I recommend signing up for Google Reader and subscribing the RSS feeds of blogs that you read. That way you can keep updated on new posts as they are published. Research is absolutely crucial when searching for jobs. Because I am focusing on social media in this post I won't go into detail but it is critical that you keep you finger on the pulse of what is happening in the city or cities you want to work in. At the very least, I like to read the business section of the paper daily but other useful sources of information include business associations, trade journals and trade associations. 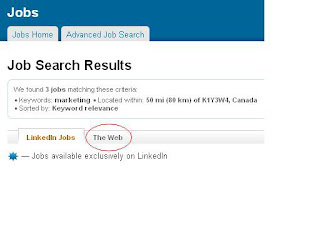 Most of these are now served by websites and those will often have a section for job postings. Examples of things to look for are: Business Association, Technology Industry or Association. Every city likes to promote itself as a great place to do business and you can really use this information to your advantage! If you find an opening or have an interview scheduled then you must do research on the company, the industry and the person or people you might be interviewing with. Obviously, LinkedIn is invaluable when it comes to this. Find the company in LinkedIn and review the list of popular profiles at the company to see who is active and see what type of experience they have and if they are connected to you in some way. You can also see if the job you are interviewing opened because somebody left, however I should mention that you will only see this if that person has updated their LinkedIn profile. LinkedIn can also give you an indication of the turnover rate at the company... is there lots of activity in terms of hires and promotions? You can also find out about people you might be working with and/or interviewing with. I like to see if we have anything in common as this information might be useful for helping to create some rapport with the interviewer. Best case, you might know somebody in common who can serve as a reference for you. I deactivated my Facebook account earlier this year but reactivated it when I started by job search. I am finding that Facebook is also a great place to find information about companies you might want to work for. See if they have a company profile and see what information is being shared. In fact you should also see if they have a Twitter account and what type of information they are tweeting about and you can also set up a search in TweetDeck for the company name to see what people are saying about them. All of this information should help you get a feel for what type of company they are... are they fun? serious? do customers appreciate their product/service? I spoke about corporate blogs earlier and I should point out here that they invaluablel in the research phase. Look to see what the company is blogging about for indication of what they are thinking about. I like to say that corporate blogs are often the most honest peek into a company and its culture you are going to get before you step foot in the office. Whitepapers and product pages are going to be written by the marketing folks but blog posts usually come directly from the employees and while most are edited, they are usually more transparent. What happens if you go for an interview and you never hear back from the company? Unfortunately, it seems to be standard procedure for companies to NOT tell you that you aren't being considered for a job. While I don't know why this is the case, I always suggest you contact them to ask before doing anything else. If that doesn't work, then you can actually use LinkedIn, Twitter or the company's blog to figure out if somebody else was hired and see if anybody tweets about signing an offer or if there is a post on the blog about a new team member. No matter what you do, stay positive. The job market is really tough right now and it is most likely going to take lots of effort to get something. I read recently that it will take about 150 contacts to get a job offer... and I have to say that this sounds about right to me. Looking for work is never easy so I always suggest that people try to enjoy it... afterall, when else do you get to meet so many interesting people that work at interesting companies!